For our eleventh episode, we kick the dial up to eleven! Tony and Jim are joined in studio by Producer/Songwriter/Rock Star extraordinaire James Michael to run down the HomeGrown Hits Top Ten. James brings his songwriting and production sensibilities to bear on our charts, giving a short commentary on each song. He drives home the point that songwriting and song structure should always trump production quality when crafting and recording a tune. James Michael is the producer, songwriter, and mixer of many chart-topping rock and pop hits of the past decade. He is a founding member (along with Nikki Sixx) and lead vocalist of Sixx:AM. The band’s debut album, which James produced, contained the No. 1 Billboard rock track of 2008, “Life is Beautiful”. He produced and co-wrote Mötley Crüe’s last studio album, which debuted at No. 4 on the Billboard Top 200 Albums. He has written for and produced artists such as Papa Roach, Alanis Morissette, James Durbin, Hinder, and Kelly Clarkson. James spoke to us just prior to heading out on tour to promote the latest Sixx:AM album, “Modern Vintage”. And The Winner Is…The Upset Victory! Our Homegrown New Year’s Contest 2015 is over and the prize goes to Cincinnati-based The Upset Victory with their smart, powerful rock piece, Fake This. Congratulations, guys. The incredible Korg MS-20 Mini Keyboard and complete PreSonus Studio are yours! Thank you everyone for uploading your music! 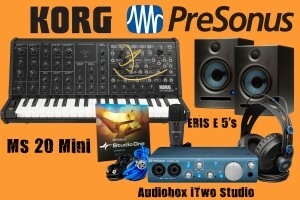 Thank you KORG and PreSonus for providing the fabulous prizes! Congratulations to everyone in the top ten! Your music is fantastic. This proves once again that you have the power, the talent, and the technology to create a Hit Song. Happy New Year from Tony and Jim. Ever sit at home New Years and watch the ball drop on TV? No one to kiss at midnight? WRITE A SONG ABOUT IT AND WIN! HomeGrownHits new years Rock’n Eve song contest. Our Sponsors KORG and PreSonus have put together a fantastic home studio set-up. KORG is providing the MS 20 Mini. This is a Monster give away for the winner and Sooo very Cool. PreSonus is providing a full AudioBox iTwo Studio with a Pair of Eris E 5 Studio Monitors. This also Extremely Cool and amazingly generous prize! This complete home studio will provide you the power to create music with sounds you never thought you had in you! The contest is over and the winner is The Upset Victory, with Fake This. We made it to Episode #10! To celebrate, Tony and Jim count down the winning songs of our 7 contests over the past 2 years on HomeGrownHits.com. To help us introduce each of these spectacular contest-winning tunes, we talk to as many of the winners as we could get a hold of to see what they’ve been up to! Our ““Home Grown Hits for the Holidays” Song Contest” is over, and the grand prize winner is the UK-based Sugardoll, with their song Top of the World. Their writing and performing skills earns them the top prize, a fully loaded Gibson Brands home studio plus a feature profile on Recording magazine’s website and e-newsletter! Free subscription to Recording magazine go to Sugardoll, along with the following spectacular artists: Joe Lamb, who had 2 songs in the Contest top ten (“Giving Up” and “When We Were Young”); AR3A (“theN0thing”); Zach Saunders (“Wonderful”); J.T. & the Blue Mountain Stone (“All I Want (for Christmas)”); Ben Davis (“Mind Games”); Thanai, with two songs in the Contest top ten (“Our Lies” and “Cigarettes”); and Coral Bones (“Youthemism”). Thanks to Gibson Brands and Recording magazine for donating the prizes. And thanks to all the talented artists that uploaded 87 songs and made our contest such a success!